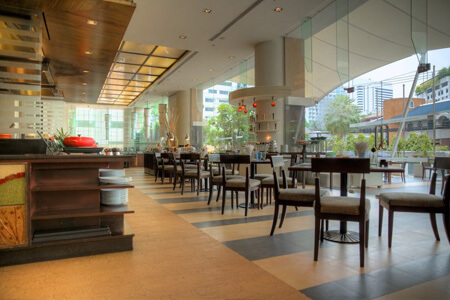 Café De Nîmes was opened in 2005, along with the successful opening with the Grand Sukhumvit Hotel Bangkok. All Day Dining Bangkok Restaurant at Café De Nîmes open 7 days a week for Breakfast, Lunch and Dinner, offering an array of themed Bangkok Buffet Promotion with both Asian and International A la Carte selections to choose from. 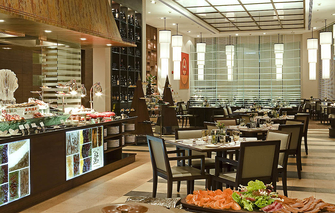 With an alfresco outdoor dining area and indoor restaurant, this Bangkok Restaurant is your ideal venue for a sumptuous meal be it a la carte or our Bangkok Buffet Promotion. 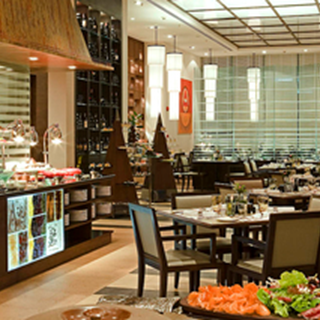 With an international kitchen team, Café De Nîmes at this Sukhumvit Hotel offers an extensive variety of cuisines with a mix of International and Asian delights from around the world, as well as themed buffet evenings such as the Grand Seafood Buffet Bangkok. Cheap seafood buffet recommended not overcrowded. We went on songkran day 13 plenty of seats and tables. Food is ok. I recommend the lamb. Order from the chef then it’s brought to the table. I appreciated service of your staff and food are fresh and delicious. The food was really fantastic, the decor really let it down. The restaurant has the feel of a school cafe, not the lovely dining experience we were looking for on Christmas Day and not on a level with the food. The staff were also very lovely.